Krystle Lee Anderson lost her legs after she used a BB gun to hold some people hostage, resulting in a shootout with law enforcement that caused her disability. That didn’t keep her from getting into trouble, as she failed to appear in court on the armed kidnapping and assault charges that stemmed from her Burger King shootout in 2015. Law enforcement got a tip that she was hiding at the Winter Haven home of her boyfriend, John Carr Jr. When marshals arrived at his home, Carr claimed that she wasn’t in the home, but one of the officers knew better: he saw Carr through the window as he stuffed Anderson into a plastic storage container. Officers located her and took her into custody. 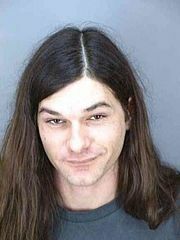 Carr was also charged with resisting arrest/obstruction of justice. Florida doesn’t have a specific law against harboring a fugitive, but he could be charged as an accessory after the fact, which would be a felony. Anderson faces life in prison for her charges. Once again, the cover-up/aftermath was worse than the crime. Konstantinos Georgiou fled from the scene of a crash. 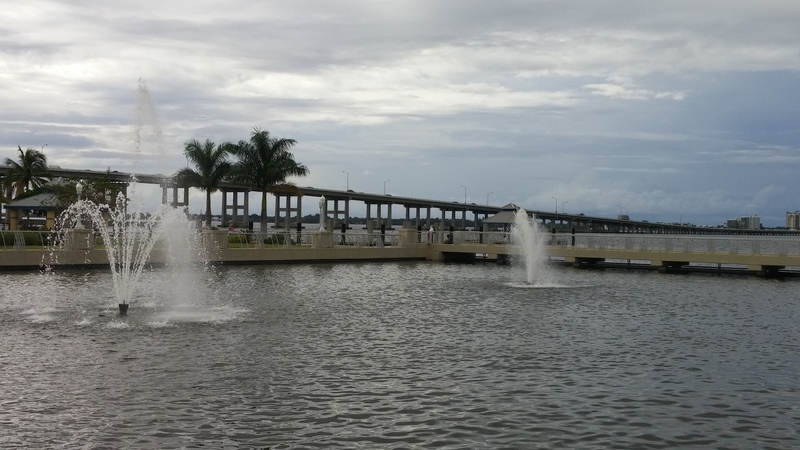 He tried to commandeer a couple of people’s vehicles, before jumping off the bridge and into the Caloosahatchee River to evade officers. The marine units finally caught up to him, clinging to the bridge supports, and had to take him to the hospital. The sad irony here is that the crash itself was not a crime, leaving the scene of the crash is only a misdemeanor… but trying to break into other peoples’ cars is a serious felony. Reports indicate he actually fought with the occupants of at least one vehicle, which makes the offense a Burglary with Battery, a Punishable by Life Felony (or PBL). His escape attempt is likely to land him in prison for many years; while the initial offense was relatively minor. He was lucky that officers located him and saved him from the river, it could have ended a lot worse after jumping off the bridge! 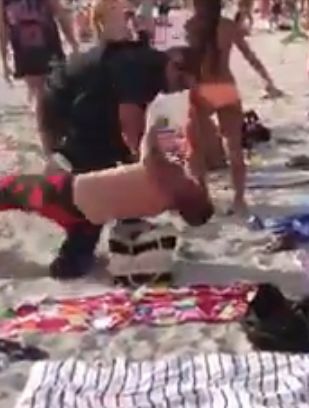 Spring breaker Darrell Tate caught some dramatic video this weekend on St. Pete beach, as two spring breakers were violently arrested by a cop. The video doesn’t show what initiated the contact by the deputy, but it does show both young men resisting. The officer does not draw a weapon, using only his hands, and is able to subdue both of the suspects. They have both been charged with battery on a law enforcement officer, a felony. I’m not big into wrestling, but apparently the deputy’s move is called a ‘choke slam’. He’s a big dude. The whole experience must have been scary for the cop, in spite of his size. Don’t fight cops, kids. 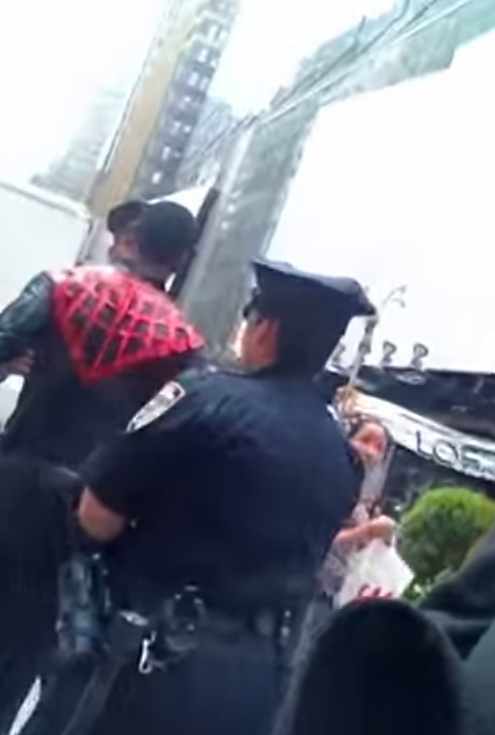 The New York Post has posted video footage (cell-phone) of Spider-Man’s arrest and violent resisting on YouTube. You can see what preceded the video, prior to the arrest, but you can clearly see Spidey taking swings at the cops. You just can’t do that. He’s been charged with Assault on an Officer, and I’m not familiar with the intricacies of New York law, but the equivalent “Battery on LEO” charge in would be a felony that he could expect to see incarceration for, as is the additional charge of Resisting with Violence. The most amazing part of the video is the look on the face of Elmo in the back ground. 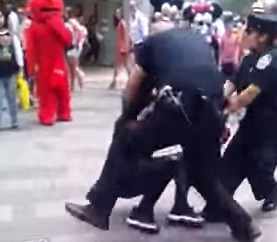 Elmo is flabbergasted by this violent turn of events, a surprise in itself, given Elmo’s run-ins with the law. Learn Spidey’s lesson, do not swing at cops. Florida law, and probably most states, do not permit violently resisting law enforcement officers.